Hello, and a special welcome to those of you who subscribed after my visits to the University of Florida’s Society of Women Engineers in Gainesville and the Frontiers of Flight Museum in Dallas in March. This month’s science “snack” celebrates the 35th anniversary of the first Space Shuttle flight. 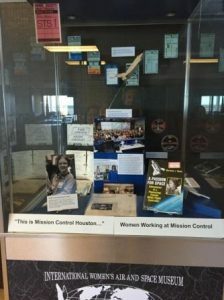 Caption: New Women Flight Controllers exhibit at the International Women in Aviation and Space Museum in Cleveland, Ohio, includes my donated STS-1 FAO console copies of Ascent and Entry Checklists, my pink STS-1 badge, and a copy of my memoir, A Passion for Space, that details early shuttle flight operations. Thanks to Museum Board Member Marcy Frumker and Executive Director Heather Alexander for creating this exhibit to help inspire the next generation of flight controllers. Photo by IWASM, 2016. April 12, 2016 is the 35th anniversary of the first Space Shuttle launch. My husband (Thor) and I were privileged to be part of the Mission Control team at Johnson Space Center. Thor, training to become a Guidance Officer, served as Winds. I was Timeline, training to become a Flight Activities Officer. What was it like to be flight controllers? My memoir, A Passion for Space, has a detailed account, but the short answer is, “Cool!” For a pair of physicists who like solving mysteries and learning new things, it was the best job in the world. A favorite memory from STS-1 was the first TV download of the payload bay. Violent shaking during launch had dislodged wayward bolts and washers that floated out. (Remember from my November 2015 Science Snacks: things float in space because of freefall, not because there isn’t any gravity!) Also visible were dark areas on the engine pods where thermal tiles had shaken off. 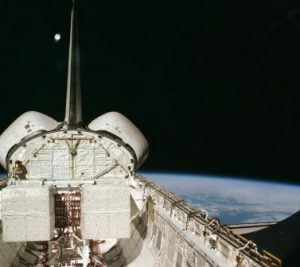 Caption: The first television broadcast from the Space Shuttle (during its second orbit) showed a majestic view of Earth from space after the successful launch and opening of the payload bay doors, but also the dark squares of tiles missing off the orbital maneuvering pods on either side of the tail. (White dot is reflection in window.) NASA image, 1981. I reacted to this transmission in typical flight controller fashion, with both awe and concern. Awe that the world’s first winged spaceship and its crew (John Young and Robert Crippen) had survived a never-before-tested launch on top of a giant fuel tank with boosters strapped to either side, and then proceeded to successfully open its ungainly doors to provide cooling and access to space. Amazing! The concern was for what we didn’t know. The missing tiles were not in a critical area, but as we’d learn tragically in 2003, a hole in the wings or underside could cause Columbia to burn up during entry. We didn’t yet have an arm to peer over the side, so management worked with the military to scan the underbelly of the orbiter. Flight controllers helped determine timing to get the lighting, orientation, and ground track just right for telescopes. Unfortunately, clouds interfered with data collection. Thus flight controllers anxiously watched for signs of equipment overheating during the entry on April 14, 1981. 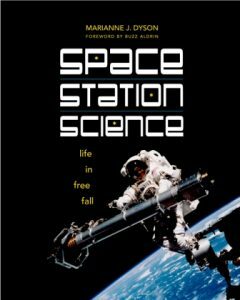 With no relay satellites (first deployed on STS-6 in 1983), they endured 20 minutes of communications blackout during entry through the upper atmosphere. We all breathed a sigh of relief when data resumed and showed them “perfectly nominal.” Young and Crippen landed safely in California. They returned to Houston later that day, and Thor and I joined the crowd to welcome our heroes home. To learn more about the historic Space Shuttle Program, I encourage you to read books and visit exhibits at museums and NASA centers. (Or ask me questions at one of the events below!) And if you like solving mysteries and learning new things, you might try becoming a flight controller. It’s definitely a cool job! The anthology, Trajectories that contains my story, “The Breath of Mars” is now available. If you order after using the link from my website, I get a credit from Amazon and you get a big THANK YOU! Look for me at the following events. Watch my website Contact page for updates. Saturday, April 9, 11 am to 4:15 pm. Selling/signing books at Reach for the Stars STEM Festival, Rice University. Free, but preregistration required. April 19-20. Staffing booth #2242 “Houston Authors,” Texas Library Association Annual Conference, GRB Convention Center, Houston. Saturday, April 23, 10 am to 4:30 pm, Festival Author signing at Table 56 in Ballroom, panel on NF at 12:45 Room B, Ohioana Book Festival, Columbus, Ohio. Saturday, May 7, 6:30 pm. NASA Enthusiasts, Chelsea Wine Bar, 4106 Nasa Pkwy, El Lago, TX 77586. Free, open to public. Friday, May 20, Author visit, Woodridge Forest Middle School, Porter, TX. Speaking to 8th graders about their Future Space. Saturday, May 28. Speaking at Gulf Coast Mensa Regional Gathering, Crowne Plaza Northwest-Brookhollow, 12801 Northwest Freeway, Houston. Open to public. Saturday, June 18, panels 10-11 am and 1-2 pm. Comicpalooza, GRB Convention Center, Houston. Saturday, June 25, Mars talk & teacher workshops, Center for Earth and Space Science Education, Tyler Junior College. Hello, and a special welcome to those of you who subscribed after my visits to NASA Glenn’s AIAA section and the International Women in Aviation & Space Museum in Ohio in February. I look forward to sharing space stories with you, and seeing some of you again at upcoming appearances (listed below). I hope your brain enjoys its science “snack” this month! 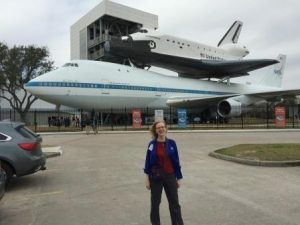 Caption: I played Tour Guide for the American Engineering Geologists’ visit to Space Center Houston February 13. 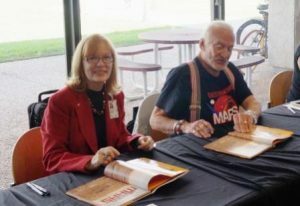 Later this month, I’ll be doing the activity on pages 60-61 in Welcome to Mars (coauthored with Buzz Aldrin) comparing Earth with Mars with 60 girls attending a spring break STEM camp at the Frontiers of Flight Museum in Dallas. The activity compares the two worlds by diameter, volume, and mass. Considering Mars is one half as wide, one sixth as big, and one tenth as massive, why then does a person on the surface weight about one third as much as on Earth? The answer is because weight is a measure of gravity’s downward pull, and gravity depends on two things: mass and (the square of) the distance from the center of mass. To avoid any messy math, I suggest using “Earth” units. In other words, the radius of Mars is simply half the radius of Earth versus 4,221 miles; and the mass is simply one tenth that of Earth versus 7 followed by 20 zeroes in tons! Fortunately, calculating gravity does not require any fancy equations, just multiplication and division. Gravity equals a constant (G) times the mass (M) of the world divided by the square of the distance (R)(R) from the center of mass. Gravity of Earth=GM/R². So gravity of Mars in Earth units equals G (0.1M)/(0.5R)(0.5R). If we then divide that by Earth’s gravity, the G, M’s, and R’s all cancel out to 1, and we’re left with 0.1/(0.5)(0.5)=0.4. The actual value (in the “The Facts” table on page 61) is 0.37 which is most often rounded to one third. 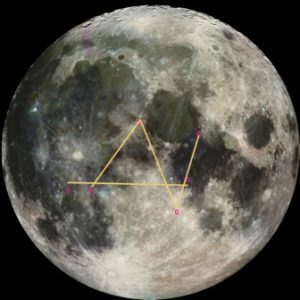 Note that the gravity of the Moon (which is one hundredth the mass and a quarter of the radius) is (0.01M)/(0.25R)(0.25R) which is 0.16, about one sixth of Earth. 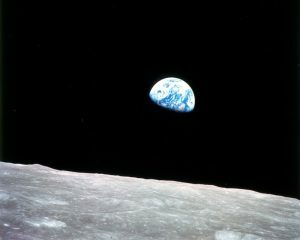 To feel how much something weighs on Earth versus on Mars or the Moon, fill three plastic bags or Easter eggs with 100 pennies or nickels for Earth, 37 for Mars, and 16 for the Moon. I wonder if shoes would last three times longer on Mars? Or would we just decide to go barefoot? The anthology, Touching the Face of the Cosmos: On the Intersection of Space Travel and Religion that contains my story, “The Right of Interference” is now available in paperback. If you order after using the link from my website, I get a credit from Amazon and you get a big THANK YOU! Look for me at the following events. Watch my website Contact page for updates and local (Houston) events. Monday, March 7, 6:15 pm, Reitz Union Room 2365. Speaking to the UF. Society of Women Engineers, Gainesville, FL. Tuesday, March 15. Welcome to Mars workshops as part of Spring Break Camp for Girls, Frontiers of Flight Museum, Dallas Love Field. April 19-21. Staffing booth of Houston Authors, Texas Library Association Annual Conference, GRB Convention Center, Houston. Saturday, April 23. Featured Author, Ohioana Book Festival, Columbus, Ohio. Hello, and thanks for subscribing to my monthly Science Snacks newsletter. I hope to see some of you at my upcoming appearances (listed below) and share space stories with you! In the January Science Snacks, I discussed the recent discovery of liquid water on Mars and that several pages of Welcome to Mars (coauthored with Buzz Aldrin) are being updated to reflect the discovery. The changes (to pages 12 and 70) weren’t ready in time to be included in the second print run. But the second printing (on right in image) does include rotation of the robots on the cover flap, and a change to the Martian Home art on pages 80-81. Caption: The Martian Home art depicts a scene from a future settlement where kids enjoy Buzz’s favorite coconut ice cream (note the goat and a coconut palm!) at his Ice Cream Parlor while adults dine at my Pasta Palace. The question is, should the sky above be pink or blue? The “true” color of the Martian sky has been debated since the first spacecraft sent back images from the surface. Most NASA images show a pink or butterscotch sky. This color results from dust suspended in the atmosphere, similar to dusty or smoggy skies on Earth. 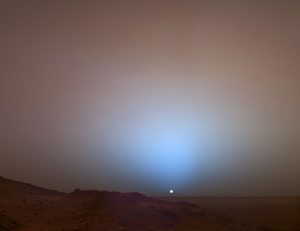 But dust also scatters blue light, as seen in sunset photos taken by the rover Spirit. And under some conditions, such as when ice clouds form, the sky may appear violet (see images). The scene depicted in the Martian Home art may be from a buried habitat with an artificial sky. (As noted on page 75, “Under 16 feet of dirt, we’ll get the same amount of radiation we get on the surface of Earth.”) Or the art might reflect the sky after terraforming has thickened the atmosphere as shown in the Green Mars art on pages 88-89. However, to be consistent with the cover illustration showing a future Mars city under a dome (that protects from radiation via coatings or clear gel of some kind) with a lovely pink sky in the background, we decided to recolor the illustration on pages 80-81. While researching this topic, I answered another question about the sky on Mars—do the stars twinkle there at night? The answer: no, the air is too thin. (“Why do stars twinkle, and do they twinkle on Mars?” by Whitehead, Hizinga, and Mossman, American Journal of Physics, 2012) But, if you observe from inside the Mars Home dome, would they twinkle? Let’s build one and find out! The anthology, Touching the Face of the Cosmos: On the Intersection of Space Travel and Religion that contains my story, “The Right of Interference” is out via Kindle and will be available in paperback March 1. If you order after using the link from my website, I get a credit from Amazon. I’ll be speaking at the following events. Watch my website Contact page for updates and local (Houston) events. Thursday, February 18, 5:30 pm. AIAA Distinguished Lecturer. Ohio Space Institute, 22800 Cedar Point Road, Cleveland, OH 44142. Free, open to the public. Friday, February 19, speaker for “Dinner with a Slice of History.” International Women in Air & Space Museum, Burke Lakefront Airport, 1501 North Marginal Road, Cleveland, OH 44114. Open to the public. Tickets $15-17. Proceeds benefit museum. Saturday, April 23, Ohioana Book Festival, Featured Author. Sheraton Columbus Hotel at Capitol Square, 75 E. State St., Columbus, OH 43215. Hello, and a special welcome to the new subscribers who signed up at Kennedy Space Center. Each month I pick one short science news or fact to share. I hope to see many of you again at future space or writing events where we can discuss our space stories! 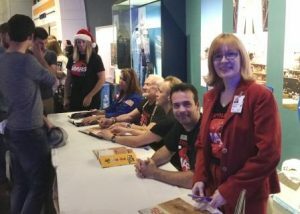 Buzz & I signed Welcome to Mars at Kennedy Space Center on December 19, 2015 with help from Christina (Santa hat), & ShareSpace team of Linn, Rob, & Bob. 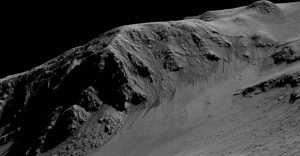 On September 28, 2015, Georgia Tech grad student Lujendra Ojha published her evidence of liquid water on the surface of Mars. 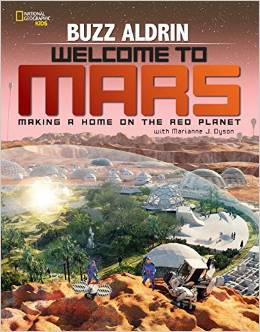 That same week, the first print run of Welcome to Mars was nearly sold out. Our editor at NatGeo suggested we reflect the water discovery in the second print run. So I asked myself, what impact does finding liquid water have to our plans to settle Mars? It wasn’t news that there is water on Mars. Astronomers have observed the polar ice caps wax and wane with the seasons for more than a century. The Viking landers photographed frost forming on the surface. The Mars Phoenix Lander released video of ice sublimating (vaporizing) from the soil underneath its thrusters. The Curiosity rover found sufficient ice in the dirt that 3 cubic feet (0.08 m3) when heated, would produce enough water (6 pints or 2.8 L) for a person for a day. Additionally, there is ample evidence from orbiting spacecraft that Mars once had oceans. Many have speculated that some of this water remains in underground aquifers. But no one expected to find liquid water ON THE SURFACE of Mars! The atmospheric pressure is so low, and the temperature so cold, that exposed water ice should instantly sublimate like we saw with the Phoenix lander. But Ojha’s analyses of Martian surface features called Recurring Slope lineae (RSL) show water does flow on the surface. The salts in the water act like antifreeze and allow it to be liquid at temperatures below freezing. Caption: Recurring Slope Lineae (RSL), on Horowitz Crater in southern hemisphere of Mars (32 degrees south latitude, 141 east longitude), appear as dark streaks about the length of a football field. Image credit: NASA/JPL-Caltech/Univ. of Arizona. Finding water on the surface indicates that water is even more abundant than predicted. This is good news and may expand possible sites for future settlement. Or not. The presence of liquid water also increases the chances of finding alien microbes on Mars. If microbes are confirmed, is that a reason to slow or halt human settlements so as not to contaminate them or be contaminated by them? 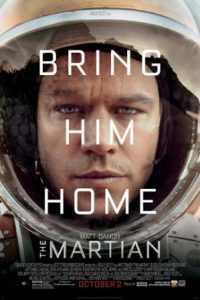 The answer to this question depends on the nature of the Martian “bugs” and what they need from their environment to survive. Once we know that, we can determine if our use of, or changes to “their” water or minerals or energy source would be of benefit or harm to them or to us. But just knowing that something can live on Mars as it exists today would be very encouraging to our own long-term survival potential there. After all, our bodies have more microbes than human cells! Yet I fear that because of our history, going back to the Martian canal controversy (1905), the Viking life science results (1977), and the Martian meteorite (1999), scientists will be reluctant to propose the experiments needed to confirm life on Mars. Who will risk having their career ruined by critics rejecting all data indicating life as illusionary patterns, chemical reactions, equipment artifacts, or contamination? Even if we send humans to Mars to observe microbes in action, someone will claim it is a hoax designed to boost NASA’s budget (which we should do anyway)! Hopefully, young scientists like Ojha will continue their important investigations so we can better prepare for life (native or transplanted) on the Red Planet. The second printing of Welcome to Mars has been updated with changes to pages 12 and 70 reflecting the discovery of liquid water on Mars. What it means to the future settlers of Mars is up to them to decide! If your kids like Welcome to Mars, they might also like The Callahan Kids: Tales of Life on Mars. This is a collection of nine original stories about the first kids (ages 11 to 14) on Mars. All the stories had their science facts checked by engineers. Read the first story (by yours truly) FREE via the link on my website. EBook is $4.99 and print books are $9.00 if you use the 10 percent off code in the right-hand column. Thursday, February 18, evening. Distinguished Lecture, Ohio Space Institute, 22800 Cedar Point Road, Cleveland, OH 44142. Details TBA. Friday, February 19, Dinner at 6:30. 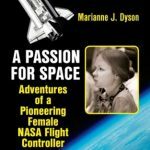 Featured speaker for “Dinner with a Slice of History,” International Women in Air & Space Museum, Burke Lakefront Airport, 1501 North Marginal Road, Cleveland, OH 44114. Tickets $17. Book sales benefit the museum. First week of March: I’ll be in Indialantic, Florida (near Melbourne) for a family reunion and would love to visit schools, libraries, astronomy clubs, women’s groups, churches, or book clubs to talk about space. Send email with contact info, and I’ll follow up.